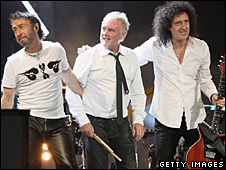 Bad Company singer Paul Rodgers says his collaboration with the surviving members of Queen is over. Rodgers joined Brian May and Roger Taylor in 2004 and performed on several tours. They also recorded an album, The Cosmos Rocks, to mixed reviews in 2008. Speaking to Billboard magazine, the singer said: "At this point we're gonna sit back from this." Queen's original singer, flamboyant frontman Freddie Mercury, died of an Aids-related illness in 1991. Rodgers has not ruled out the possibility of working together again. "It's kind of an open book, really," he said. "If they approach me to do something for charity, for instance, or something like that... I'd be very much into doing that, for sure." Queen bassist John Deacon retired from music in 1997, Rodgers joined May and Taylor for a set at the inaugural UK Music Hall of Fame Awards in 2004. They subsequently toured Europe and Japan in 2005. Rodgers hits the road with Bad Company for a 10-date run in the US this summer.